Can apparent depth be greater than real depth in any case? It's written that AO is real depth and Ao1 is apparent depth. 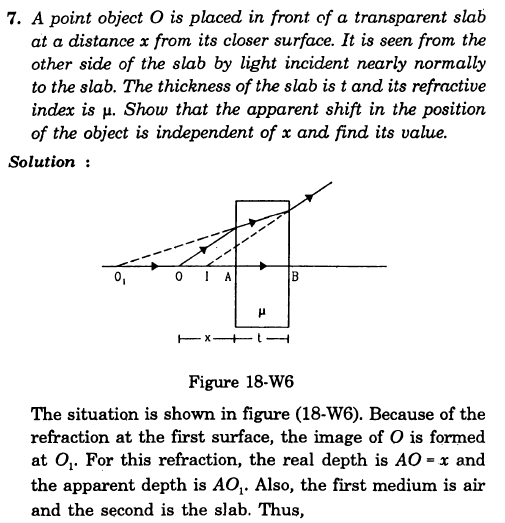 But it is looking like apparent depth is greater than real depth in the figure when oject is seen from other side of the slab. Is it possible. Can apparent depth be greater than real depth. And I have one more doubt ... In this case Real depth / Apparent depth = 1/refractive index but in general ratio of real and apparent depth equals refractive index... Why in this case this is opposite. To answer the question in your title : Yes. Apparent depth is usually less than real depth because you are looking from a medium of lower optical density (air) into a medium of higher optical density (water or glass). If you were under water looking up at an object outside of the water, it would appear further away. In the diagram, $O_1$ is the image of object $O$ when viewed from inside the glass block. It is located by tracing back rays inside the glass block. The object is in air, the observer is in glass, so this is a case in which apparent depth should be greater than real depth. $I$ is the image of object $O$ when viewed from air on the other side of the glass block. It is located by tracing back rays in air in the region of the observer. Both object and image are in air, but there is a layer of optically denser material in between, so the apparent depth is again less than the real depth. However, the ratio of real to apparent depth is not as small as it would be if $O$ were inside the block. Your formula does not work in this case because the ratio also depends on the thickness of the glass block. It is correct when there is 1 interface between different optical media - here there are 2 interfaces. Not the answer you're looking for? Browse other questions tagged geometric-optics or ask your own question. Formation on image on screen? How do I experimentally find an image projected by a lens? How is the component of a wave vector parallel to an interface made to always be real?